Rotary Sri Lanka which partnered the Government of Sri Lanka (GOSL) – Ministry of Health to ensure the country was free from polio some years back and then post the tsunami, invested Rs. 1.2 billion to ensure that 12,500 children went back to school. Last year Rotary with the Ministry of Health set up the first Human Heart Valve bank at LRH that will ensure 3,500 children live to celebrate the first birthday. Last week (2018) Rotary once again signed a historic Letter of Intent (LOI) with the Ministry of Health on the quest to make Sri Lanka dengue free by 2020. Rotary International District 3220 Governor Dushan Soza signed the LOI on behalf of the 70 Rotary Clubs in Sri Lanka, Rotaract Clubs and Interact clubs whilst on behalf of the Government of Sri Lanka, the Secretary to the Ministry of Health Janaka Sugathadasa placed his signature in the presence of Minister of Health Rajitha Senaratne and Past President Rotary worldwide K. Ravindran. 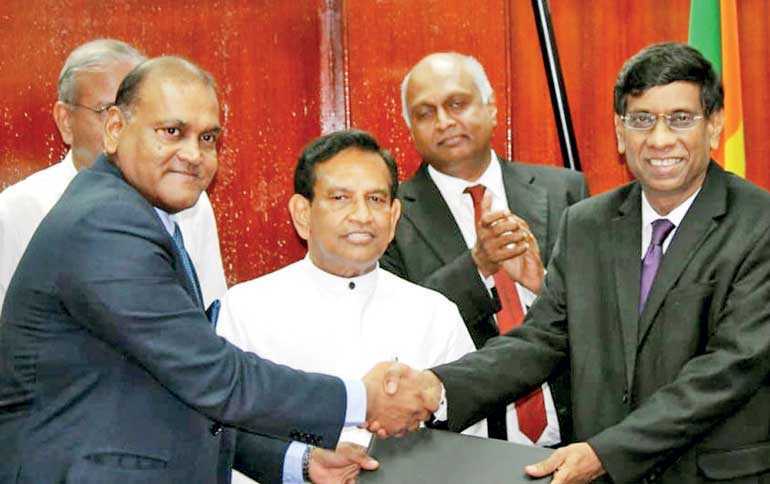 The LOI sets the stage towards collaborative agreement with National Dengue Control Unit of the Health Ministry headed by Dr. Hasitha Tissera and all Rotary Clubs of Sri Lanka on the premise of making Sri Lanka dengue free with zero deaths by 2020, said Governor Dushan Soza. The LOI included the complete control of the breeding grounds for dengue mosquitoes with continuous social mobilisation and achieve 100% traceability by 2020, he said. The work already has been kick started with Rotary the NDCU of Health Ministry ensuring that all breeding grounds in the five districts of Kurunegala, Jaffna, Batticaloa, Kandy and Colombo will be cleaned within three months. This includes Rotarians to introduce IT networks, web based systems and social apps for data acquisitions, reporting and monitoring. Subsequently Rotarians are to introduce NDCU approved OviTraps to trap the larvae and use them as monitoring tool with continuous monitoring. Dr. Hasitha Tissera stated that they will continue to invest on R&D on dengue mosquito and larvae, to learn more on dengue mosquito breeding so that they develop a solution more accurately. The Governor Rotary Soza went on to state, “We will also launch social awareness campaigns and community engagement so that entire public is involved in the mission from school kids to adults. The Interactors, Rotaractors and the Rotary Clubs across the country will give leadership to the project in partnership with the Ministry of Health. The Ministry is engaging the expertise of the global entity World Health Organization (WHO) on R&D, mosquito repellents, plants and flowers, and new methodologies to eradicate this deadly menace that has taken the lives of many Sri Lankans in the last few years.